NEWNAN, Ga. -- The search is on for an original Pablo Picasso etching. The piece was stolen in mid-September to early October, from a home in Newnan. The sketch was created in 1968 and is 31 in a series of 50. It was last sold by Christie's Auction House in London for $15,000 back in March of 2006. Anyone with information on the whereabouts of this etching are asked to contact Sgt. Chad Wood 770-254-2355 x 116 or 404-535-0489. NEWNAN, Ga. -- An abducted Newnan child is now back with his father after police say he was kidnapped by his non-custodial mother. The search came to an end early Tuesday morning when Gwinnett County police and ICE officers kicked down the door of an apartment, where they say Victoria Chancy and her son were sleeping. The boy's family said police were as much to blame as anyone in the case -- they are the ones who took the order, showed up at the boy's home and demanded that the the child's father -- who has full custody -- hand him over. NEWNAN, Ga. -- Ultimate Aircraft is looking for more than 80 new employees to work at Hartsfield-Jackson Atlanta International Airport. The aviation services company will hold a hiring fair on Wednesday, July 15 from 9 a.m. to 1 p.m. at the Goodwill Newnan Career Center, located at 228 Bullsboro Drive. Attendees are asked to dress professionally, and bring copies of their résumés and two forms of identification. Company representatives will conduct onsite interviews and on-the-spot hiring for aircraft appearance detail crew members and supervisors. For more information, call the Newnan Career Center at 678-423-3562. NEWNAN, Ga. -- A shootout hundreds of miles away in front of a Dallas, Texas police station could have a very local tie - the armored, gun-ported van that the shooter used to mount his attack. The distinctive van that the suspect used in the shooting is seemingly identical to one that 11Alive has confirmed was sold less than a week ago in an online auction. The van was sold on eBay by a small family-run Newnan business that sells and rents commercial trucks and vans. 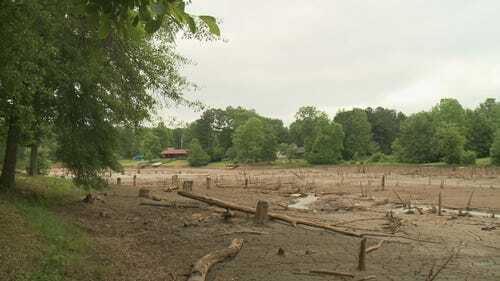 NEWNAN, Ga. -- An oversized mud puddle is all that's left of Aspen Lake in Coweta County. Behind the puddle is what's left of an earthen dam that held the water back – until early Monday, when the dam broke and the lake drained. "Oh I loved this lake," said Joey Haack, who moved into a lakefront home nine years ago. "We have nothing but a bog now. So it's devastating." COWETA COUNTY, Ga. -- Police are investigating a serious accident on Interstate 85 north in Coweta County. It began when a mail truck hit a bridge on I-85 at Highway 34 Monday morning. The truck caught fire, according to the Georgia Department of Transportation. There were no immediate reports of any injuries. Both I-85 north and Highway 34 were shut down for hours. They have since reopened.